Here on the riverside, the dominant sound is of honking geese flying south in formation. The dominant visual is of bare trees with a carpet of crunchy leaves on the ground below. Fall foliage is stunning. But now the landscape is composed of bare trees and evergreens punctuated by an occasional burst of color from a deciduous tree that has not yet let go of its leaves. Inspired by all this, there are two questions on my mind. 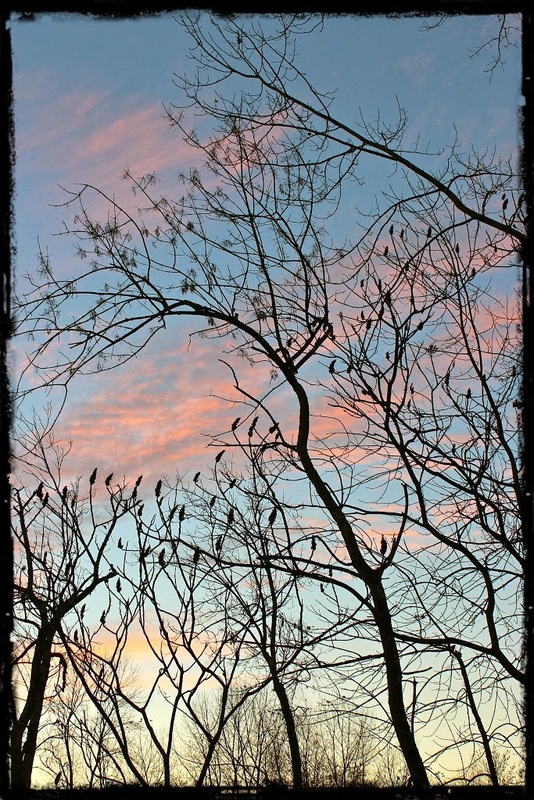 The bare trees invite me to consider: What has outlived its usefulness in my life? 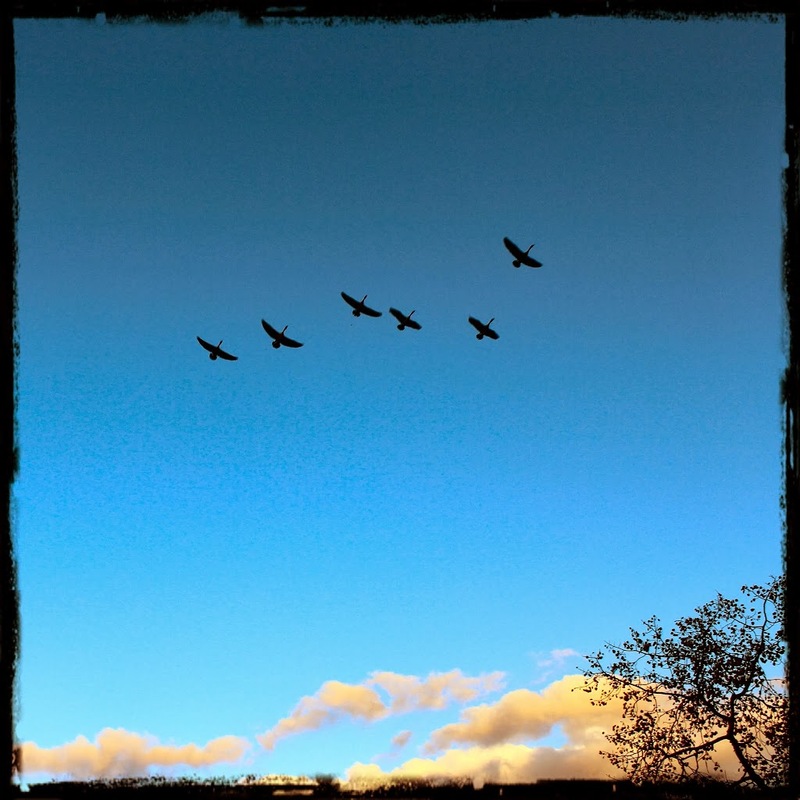 The migrating geese inspire me to ask: Where is my highest wisdom calling me? Fall is a time of letting go, creating space for new growth. In between releasing and rebirth/renewal, we here in the Northeast move inward for a time of resting and dreaming. But first, we must let go. At the most basic level, I feel an irresistible urge to get rid of possessions. We live in a small, old house with virtually no usable storage space, so everything we own is out in the open. I’m tired of looking at the clutter that merely collects dust and traps energy. If something gives me joy or is still useful, it will stay. But let the great purge begin! Perhaps my closet and library are good places to start. But I am contemplating letting go on other levels as well, especially letting go of outdated, limiting beliefs and sabotaging thoughts. Actually, that is a huge part of it – perhaps the most important part of all – for sometimes thoughts can be like prison guards keeping us locked in a cage and preventing us from moving forward. Our materialistic culture values accumulation, getting and achieving more and more, expecting that our investments of money and time will pay off and provide us with a comfortable, “successful” life. But there is an art to letting go – releasing what has outlived its usefulness just as trees release their leaves when the time is right and birds migrate with changing seasons. We build houses with rocks that are perhaps put to better use as stepping stones. Has the highest part of us moved on, following the flow of the living universe to new horizons – or is the self-centered personality restless like a discontented child? That seems to be the critical discernment. There are some situations in which some training and discipline could help us to make the most of our present life situation and lead a more fulfilled and joyful life. There are other situations that have lost their value with no reasonable expectation of bouncing back, and we need to make our peace and move on with gratitude for the experience. Trees release their leaves when the time is right and are bare for a while. Their energy is drawn inward, and they enter a period of rest. In time, the next generation of leaves will manifest and collect energy from the sun. The rhythm repeats itself every year, inviting us to trust that letting go will result in rebirth and renewal, and to honor the in between period of rest that is necessary for our growth and cannot be rushed. During this time, we do not draw our energy from the outside world. We go within. It is quiet enough during the cold months to hear the still voice within – our deepest wisdom. Even if it looks like nothing is happening on the outside, a hidden transformation is taking place. I believe that the highest in us (that some call the soul) goes where life energy flows and understands that challenging circumstances are valuable for the clarity they provide – and gives thanks for them, without harboring any grudges or regrets. For example, it’s okay if something in which you invested a lot of time and/or money loses its value. If you have derived your identity or self-worth from it, you learn that you are so much more than this one thing; your existence does not depend upon it. Praise and bless it as a stepping stone. Let it go, and move on if that is what you feel deeply called to do. When the time is right, you will know. The soul doesn’t care how much money or time you spent to get to this place where you are now. It grabs your hand and says, “Come on! There’s more yet to see.” It follows the flow of life. It is like a migratory bird acutely aware of the subtle signs heralding a new season. It knows when to leave and in what direction to travel. Basically, I believe that great changes occur when love pulls you toward something rather than when you are motivated to move away from something that has lost its value. Recently, a friend pointed out that what we move toward might be an ideal or quality rather than a particular outcome. Perhaps we begin to focus on inner peace, freedom, or joy, and as we attune to that vibration, the details begin to take shape. It is a process that requires honesty, courage, and patience. I truly believe this to be true. Without making any drastic changes, simply take a step in joy, and notice what happens. In my experience, inner peace and joy draw synchronicity to us, and each step reveals new possibilities and small miracles. Without even looking for them, I’ve recently come across some articles related to exciting discoveries about neuroplasticity – how the brain rewires itself constantly based on experience. The following links offer much hope regarding our ability to continue growing, improving, and reinventing ourselves as we age. Midlife Crisis – or Power Surge? The third link was especially powerful for me and brought to mind my participation in a women’s group at a local retreat center more than a decade ago. At the time, I was in my mid-30s and was the youngest one in the group, and I was contemplating what to do for work after staying home with my children for a number of years, thinking it was too late for me to pursue a new career. I listened to women in their 50s and 60s talk about reinventing themselves as the article describes, and it helped me put things into perspective. I think what cut through my illusions more than anything else was their laughter when I voiced that I felt it was too late in life for me to switch gears and go back to grad school. It was delighted, authentic laughter filled with such compassion and wisdom. I learned from these women that it is never too late to reinvent yourself. Letting go, as nature models so boldly to us at this time of year, is the first step. The photographs in this blog and in my Flickr photostream are available for purchase as prints or cards through my Etsy shop by selecting a “custom print” in whatever size you prefer and indicating either the name of the print or the blog post and order in which it appears.